The Suwannee may be Florida’s best-known river. In the past, this fame came by way of a popular song. Today, however, it is the relative “wildness” of the Suwannee that makes it a natural wonder. Along its entire 235-mile length, only a handful of small communities overlook her waters; the largest having populations barely exceeding 1,000. Away from towns, homes are relatively scarce. In some places you can travel for miles without seeing any sign of civilization. The Trail starts at White Springs and follows the river for 171 miles to the Gulf of Mexico. Central to this system are eight “hubs,” mostly state parks and towns that offer a variety of activities and services for trail users. While the trail is primarily geared toward paddlers, the hubs offer trail users the opportunity to expand their exploration of the area by bicycle, horseback, or on foot. In the hub towns of White Springs, Dowling Park, Branford, Fanning Springs and Suwannee, overnight accommodations can be found in hotels and inns. The park hubs, located at Stephen Foster Folk Culture Center State Park, Suwannee River State Park, Lafayette Blue Springs State Park and Fanning Springs State Park, have vacation cabins that sleep six people and are furnished with gas fireplaces, kitchenette and screened porch. At the privately owned Spirit of the Suwannee Music Park, you can sleep in your tent, cabin or a tree house! Between hubs, in more remote areas along the river, “river camps” have been built to serve paddlers on the trail. These can be accessed by river only. The river camps all have the same components — five screened sleeping platforms with electricity and ceiling fans, restrooms with hot showers, potable water, picnic areas and fire rings. While they all have the same basic features, each river camp has its own personality. Whereas the platforms at Holton Creek river camp are situated in a deeply shaded stand of hardwoods, interspersed among sinkholes and swales, Adams River camp is high, dry and open — a reflection of the surrounding longleaf pine community. 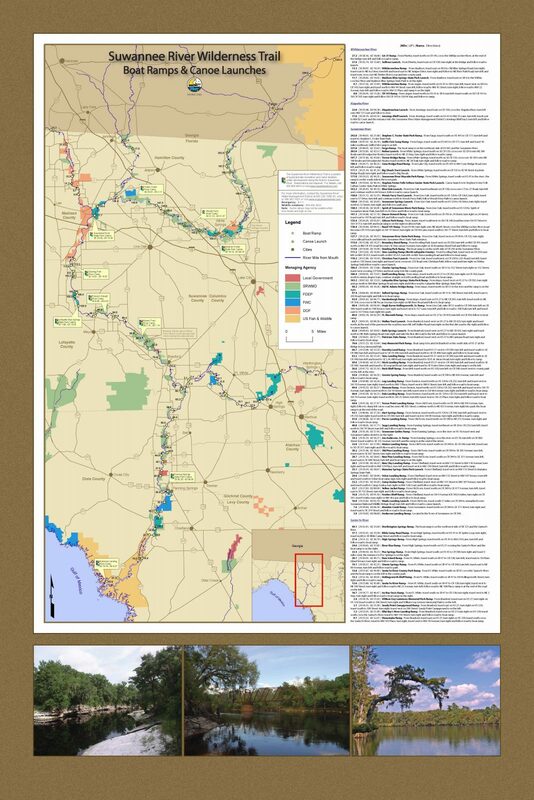 A one-page map of the trail is provided by the Suwannee River Water Management District. Click here for the one-page map. The following 72-page Suwannee River Widlerness Trail guide is provided courtesy of Visit Natural North Florida. • For cabins at any of the Florida state parks along the Suwannee River, call Reserve America at 800.326.3521 or (866) I CAMP FL or visit www.ReserveAmerica.com. Fees vary. • For river camps, or to get information about additional lodging elsewhere along the trail, call 800.868.9914. Fees may apply. • For lodging elsewhere along the trail, view the Places to Stay sectionn of this website or www.SuwanneeRiver.com for a list of private campgrounds, cabins, motels and bed and breakfasts. Before starting your trip, you should consider visiting the State of Florida’s Suwannee River Wilderness Trail Headquarters, located at 4298 NW County Road 292, Mayo, FL (800.868.9914, 386.294.1120). The headquarters includes brochures and displays about the trail. Here is an intersting article about one person's solo paddle of the entire Suwanee River. Disclaimer: The Original Florida Tourism Task Force (dba VisitNatural Nroth Florida) and the North Central Florida Regional Planning Council do not warrant the accuracy or timeliness of this map and paddle guide or the safety of this trail for use by paddlers. Paddlers should use this trail only if they have the adequate skill level and dquipment, and paddlers must make that determination. Paddlers should also check weather forecases and wter levels in advance to avoid any unnecessary danger. The Original Florida Tourism Task Force, the local governments in which these paddling trails are located and the North Central Florida Regional Planning Council are not responsible for any damages whatsoever from its use.